Iklhas or Sincerity is the third talk in the 5 Sunday Series on Tasawwuf (2009-2010) and the Importance of a Guide. “Success Through Sincerity” is a dars by Shaykh Ahmed Abdur Rashid, given on January 24th, 2010 at the zawiya of Shaykh Nooruddeen. Allahumma salle ‘ala sayeddina Muhammed al fatih oghliq wa-al Hatim limaa-sabaq naser al haqq bil haqq wa-al haadi ila siratiqa-l-mustaqeem, wa ala alehi wa sahbehi haqq qadrihi wa miqdarihi al adheem. O Allah shower your blessings upon our master Muhammad, The Opener of what has been closed and the seal of what has passed, the Champion of Truth by the Truth, and the Guide to Your straight path, and on his family and his companions with the equivalent to the greatness due to his exalted status. Insh’Allah, by this time, I hope that those of you who have been following this series of durus have come to sense, if not yet fully understand, the honor and the blessing of Tariqa and the personal responsibility of the seeker. We have spoken in this series about the necessity and function of the Murshid and the oral tradition of Suhbat. Now we come to the more subtle means to developing the character qualities that are the foundation for spiritual success. That subtlety lies in Ikhlas, sincerity. It stems from the fact that control over inner progress resides in the individual, not in the teacher; yet the means for understanding and implementing progress resides in the Shaykh or Murshid. The quality of our sincerity determines our ability to hear, understand, and gain from munasabat with the Shaykh. The subtlety of the path lies in learning the art of sincerity through suhbat, muraqabah, ibada and dhikr; but the core venue is suhbat, keeping good company. The Naqshbandiya describe Suhbat as the most elevated and most effective method to reach Allah. Sincerity is not only just a matter of the time spent sitting or reciting, but also gratitude for being on this path and in the company of those who are pious and adept. Keeping the company of the ‘good people’ is keeping company of the Sincere. I will speak today about the tree of Ikhlas, with its roots planted firmly in niyyat, its trunk and strength coming from loyalty and dedication, and its fruits of progress, inner clarity, and peace. But throughout my talk, I ask you to remember that ikhlas only grows in the fertile soil of suhbat. Truly We distinguished them with a distinct quality—remembrance of the [Final] Abode. [38:46]. While the word “sincerity” does not appear in the translation, the Arabic tells another story: “AKhLASNAHUM” “We distinguished” them and “KhALISATIN” “a distinct quality” both come from the same root word, “Kh-La-Sa.” So what is this distinct quality? It has to be Ikhlas; their Ikhlas set them apart and made them free from all other ties. Ikhlas is not merely fearing the watchfulness and repercussions from a distant God, but rather learning how to see, interface and be grateful to a Divine Presence (Allah swt). A Presence experienced through the development of these qualities. For a Sufi, sincerity has three aspects. One is the sincerity and devotion with which you practice your Islamic teachings: prayer, fasting, dua and submission. The second is the sincerity with which you participate in the tariqah and follow the guidance and instruction of the Shaykh and the teachings of meditation, the dhikr, and the wazifa. And the third, the sincerity that you bring to the day to day responsibilities and activities of life. All of these are joined in one’s adab to brothers and sisters and to all living things and beings; in the way you relate to the community at large, and how you are not only in the company of pious people, but also how you are in the company of all people. What is that mystery? Is it, perhaps, that as long as you notice your sincerity, you are in need of sincerity? How, then, do we know if we are truly being sincere? Dhul Nun said, Sincerity has three signs: when the praise and blame of the common folk become equal in your eyes; when you become oblivious of your good deeds as you are doing them; and when you forget about your reward for your good deeds in the hereafter. And Abdur Rahman Sulami said that he heard Uthman of Maghribi say, Sincerity is something in which your lower soul never finds pleasure. This is the sincerity of the ordinary folk. As for the sincerity of the elect, this is something that happens to them without them knowing it. They show acts of obedience to Allah while remaining unaware of them, nor seeing nor counting them. This is the sincerity of the elect. 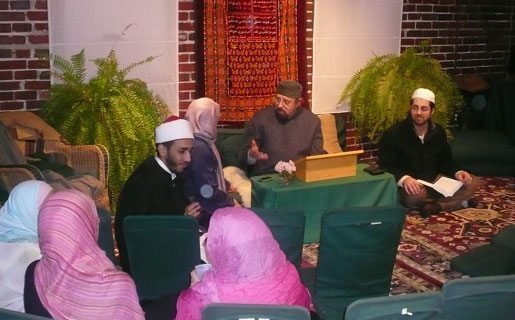 We are talking today about what it means to strive to be among those “elect.” How to arrive at true sincerity…what “sincerity” means, as it is manifest in one who has benefitted from specific guidance, who seeks out suhbat, and who strives consciously to be aware of, and live in service of the Divine Presence (Allah swt). The intellectual understanding of ikhlas will slip through the fingers like water unless it is absorbed by our hearts and minds, and eventually becomes our character trait. If you can hold onto it for a few minutes right now, then you can see that a truly sincere person does not consider what spiritual or material value is going to come to them from an act, or seek only to ensure their way to paradise. A truly sincere person does not see their own sincerity, because their attention is not on themselves, but on Allah. He or she acts from that permanent station of Ikhlas; This is a mystery that Allah has placed in the hearts of people. So, to continue; if the heart is awakened, then the sincerity is awakened. And if the heart is awakened and you have achieved or unlocked the secret of sincerity, you don’t care whether you are praised or you are not praised. And this brings me to intention. We must start where all actions originate, where all cognitive processes and actions are born…with intention. Niyyah. As I said in my opening, sincerity begins with niyyah and bears fruit by sustained dedication. Ikhlas (sincerity) of intention and action and perseverance in that sincerity, is the highest station of love and servitude to Allah. The honourable `arif and the wise wayfarer, Khwajah `Abd Allah al Ansari (qs) says: “Ikhlas means purging action of all impurities.” Here ‘impurities’ mean desire to please ones self and other creatures. Abul Hamid al Ghazali (ra) told a story about the connection between sincerity and intention. It reveals the depth of character and the instability of individual desires, and the need for striving to attain the maqam of Ikhlas . But he said, “It certainly should be cut down!” And Iblis argued with the man, but the man wrestled him to the ground. So the man acquiesced and went home, and the next morning found two dinars under his pillow. And on the second day he found two dinars under his pillow. But on the third day, he didn’t find any. When he saw this, he went out again to cut down the tree. Iblis confronted him, and they wrestled and this time it was Iblis who wrestled him to the ground. Here is a similar story about sincerity and our intention. Hearing these stories, you may ask: Can’t I make an intention to be sincere? Of course. But sincerity is not an action, it is a quality that empowers and advances action. I could say, for example, that I sincerely want to swim the English channel and make the sincere intention to do this. However, I will only have the possibility of accomplishing that challenge if I train and train for the swim. Assuming my body could possibly accomplish it, after training (A big assumption at my age), the sincerity and the intention behind it must also have the support of my Destiny; the Will of Allah. I have to have a realistic view of the probabilities, but I also must submit to the will of Allah, whatever my good intention is. How do I do that? Well, that is another series of talks, but suffice it to say that if the intended action is in line with the Will of Allah, clearly free of my ego, then it is truly fi sabil’illah and will probably be accomplished. Again, this is the subtlety of Ikhlas and niyyat. Sincerity is not sincerity if it is “I-centered” or desire driven. The Prophet (sal) said, Whosoever takes part in a military campaign in the cause of Allah but sought only booty, shall gain only what he intended. In other words, they will get out of it only what their intention was, their true intention, not their stated intention. How often are we honest with ourselves about what our true intention is? How often do we tell ourselves, and others, that our intention is one thing, when really, at the back of our mind, the intention is to get something else, to follow some desire? Having a clear and sincere intention is not always as simple as it seems. One day, the Amir went out to hunt and while he was out he became very, very thirsty. He saw a garden in the midst of the wilderness and there was a young boy sitting in the garden. The Amir asked him for water. The boy said, “We don’t have any water.” He said, “well, give me a pomegranate, then.” The boy gave him a pomegranate and the Amir tasted this pomegranate and he found it sweet beyond sweet. So he made the intention that he would appropriate that garden. He asked for another pomegranate. The boy gave him the pomegranate. This time he bit into the pomegranate and it was bitter. “Didn’t that pomegranate come from the same tree?” the Emir asked. “Yes,” said the boy. “Why is it so bitter?” he asked. That is how delicate Ikhlas is. We can loose the sincerity of our action in the blink of an eye. It’s not just making the niyyat, but having the faith and trust and sincerity that comes from your loyalty to the path that will make that niyyat come true. People say, “I made my intention but it didn’t happen.” That’s because you thought it was about the container called “intention,” not about the content of what you were putting in it. Sufyan al Thawri (ra) said, nothing is more difficult for me to treat than my intention, for indeed it turns on me. And Yusef Asbat (ar) said, Purifying one’s intention from corruption is more difficult for person’s than lengthy ijtihad . So many things interrupt it: attitudes, character attitudes, habitual patterns, tribal customs and mentalities, nationalistic customs, personal desires, love of kith and kin… So many things interrupt the pure niyyat. In the last part of my talk, I would like to turn to speaking about sincerity, ikhlas, in the context of progress and the practices. We cannot make sincerity happen. Trying to be sincere is an endless process. Acts of sincerity will come from suhbat, from perseverance in the practices, from keeping the company of the Shaykh and the company of the brothers and sisters. The right company and the right intention provide a fertile soil for sincerity a quality of our Fitruh to emerge. As human beings, we have all been given the capacity for awareness and blessing of perception, insight, and firasa (discernment). What activates these qualities, which are the reflections of the sifat of Allah (swt) implanted in our hearts, is ikhlas. The “catalytic converter,” if you will, from potential to character and action is sincerity, Ikhlas. Loyalty to what? To Allah swt. To the five pillars. Loyalty to the Prophet (sal). Loyalty to the silsila. Loyalty to those who are loyal to Allah. Loyalty to the trustworthy people. Maybe your parents, or your grandparents. Maybe your Shaykh. If you accomplish that kind of loyalty, nothing will take you from it. Why? Because it becomes part of your character and identity. In this way we can say: Sincerity comes from loyalty but it is more correct to say Sincerity is loyalty. Indeed, it could be said that loyalty is the primary attribute of the anbiyya. Think about it; was there ever a disloyal prophet? No. In fact each one was loyal to Allah, loyal to the message, against all odds, in the face of every trial and tribulation. We try to attain that loyalty that Allah placed in the hearts of the anbiyya. When we think of loyalty we think of trust, perseverance, unquestioning faith, fierce determination… Now think of those qualities applied to the practices and you will begin to understand the importance of sincerity in making progress. In our order, muraqabah, is one of our most important practices. People ask me, “How do I do that? When I am making muraqabah as in ‘meditation’, what should I be doing? What should we be doing when we are doing dhikr kafi ? Should we just repeat the name of Allah over and over again?” Well, the lips may be repeating it, but the idea is to turn your conscious toward Allah. How do you do that? Think about it this way. You have a job. You leave the house in the morning and go to your job. Imagine that on the way to work you find out that your brother or sister has an operation, it’s nothing terribly serious, but they will be in surgery. For whatever reason, you can’t be there (maybe you have an important meeting, or you’re a doctor…). So you do your work all day long, but your mind is on your brother or sister. You are carrying out your work, and doing it well, but your thoughts continue to return to your brother or sister. You sit at your desk, check your emails, you have an important meeting, or you make a presentation, but your thoughts are somewhere else. At the end of the day, as soon as you can, you leave and go to the hospital. And you see that everything is okay. In the same way, with these practices, this is the lifestyle of the Sufi; your mind is on your work, but your heart is with Allah. Thus, these practices develop love for Allah. Through our practices, we develop attitude of knowing with absolute certainty and sincerity, that everything comes from Allah. Knowing that if we have sight, it is only because Allah has created sight; if we have hearing it is only because Allah created hearing; if we have feelings, it is only because Allah has created feelings. We come to this conclusion out of practice and sincerity, not out of fear and angst. Your movements, your actions are through the will of Allah and Allah moves through your will and actions. This is first step in muraqabah …watching for a few moments a few times a day with conviction and belief that Allah is Present. The second step is turning toward Allah with your heart, and resting patiently; anticipating and receptive to the fadl to the bounties, grace and favors of Allah. You are patient and you wait, and these divine gifts flow to you; they flow into your heart. As the lover is anxious to see the beloved but will wait forever just for that glance. Through muraqabah, and tafakkur, sincere reflection, you can come to the point where you feel secure in the knowledge that you are in the company of something greater than yourself. But everything in your life distracts you from that: your friends, your coffee time; discussions about work, worries about this and that. Distractions, distractions, distractions, until, if you do not continually strive to maintain your sincerity and practice, distractions become your reality. I will conclude by speeking briefly to the relationship between sincerity and effort. You cannot discover a state of sincerity and purity of intention accidentally. You have to put the time in. People put incredible amounts of time in to things: preparation for school or work, family, travel, hobbies…. The question is, are you aware of that Presence when you do what you do, say what you say, think what you think, when you are working at what you are working at? Do you have that attitude of remembrance, that same kind of consciousness I described before, as if your beloved were on the operating table? Where you put your attention is something only you can control, but the Shaykh can guide you on how to do it. You do it yourself, but you have the madad of the Awliyya and anbiyya, the assistance. You do it yourself, but when you are in the company of others with the same goal (when you are in suhbat) you have the support and companionship that makes this easier. As we refine our ability to direct our intention, each one of us becomes deeply and sincerely engaged, loyal to Allah, loyal to the message of the Prophet (sal) – that is to say, we see the reality, importance, and efficacy of loyalty and the process that supports loyalty. We develop our loyalty to the guidance of the Shaykh, and thus our ability to better use that guidance. We can turn to Allah swt at any time, in any place, under any circumstance and be uplifted by knowing we are in the presence of Allah swt, aware of your own helplessness and your own destitution. If your own eyes don’t remind you that Allah is seeing, and if your own ears don’t remind you that Allah is hearing, and if your own tongue doesn’t remind you that there are words to be said that are uplifting, then your eyes, and ears, and your tongue are just organs of flesh to keep the body going and everything else is meaningless. The ability to live as if you were seeing Allah, and if you are not seeing Allah, knowing that Allah is seeing you is what I’ve described today. Ihsan. If you do this consistently, over time you will acquire sakina, tranquility. Your consciousness and heart will remain open and receptive to the gifts of Allah (swt), and you will receive the tajalli emanation of that oneness and unity and the radiance of that oneness. Mutarraf Ibn Abdullah offers this dua: O Allah! I seek your forgiveness for that which I sought your repentance, but to which I subsequently returned. I seek your forgiveness for that which I rendered to you from myself, but that I was not able to maintain faithfully. And I seek your forgiveness for that which I claimed I desired your face, but my heart became corrupted with that which I did. Oh Allah, make Your love dearer to me than myself and my hearing and my sight and my property and my family and more than cool water for the thirsty.